Culturecom Holdings Limited is Hong Kong’s first publicly traded Comic Book Company. 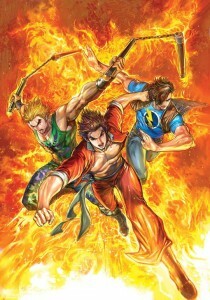 Culturecom boasts a valuable portfolio of comic book trademarks with licensing rights for over 200 comic properties including widely popular titles such as Dragon & Tiger Heroes by local Hong Kong comic artist Wong Yuk-long, Chinese Hero by Ma Wing-Shing, Feel 100% by Lau Wan Kit, Buddha’s Palm, Three Kingdoms, and top Japanese Managa comics such as Dragon Ball, Doraemon, Hikaru and the work of Osamu Tezuka, the creator of Astro Boy. One of Culturecom’s titles, the weekly publication Chinese Hero, is Hong Kong’s best-selling comic book. Dragon & Tiger Heroes holds the record for the longest running comic book publication in China and Southeast Asia and it has surpassed 1,900 issues. Culturecom has been strongly supported by its readership, providing us with the drive to break into other comic book genres and the brand’s reputation has grown along the way. Lee Chi Ching’s Strategy and Lau Wan Kit’s modern love story Feel 100%, both won the Best International Manga award from the Japanese International Manga Award competition in 2007 and 2008 respectively. This Award is considered the equivalent of an Oscar in the Manga community and our publications managed to outshine candidates from 46 different countries. Culturecom is the only company, not only in Hong Kong but worldwide, to have its titles receive this prestigious honour two years in a row, thereby demonstrating that our comic book publications are of a world-class standard. Culturecom is one of Asia’s leading comic book content provider. We have authorized more than 200 comic publications to overseas publishers in countries both in Asia, such as Thailand, Korea, Japan, Vietnam, and Singapore, and in Western countries, namely France, Spain, and The United States. Our publications have been translated into more than 10 different languages. Apart from comic publications, Culturecom produces other comic-related merchandise. These products include: picture albums, posters, stuffed toys, action figures,music, accessories, and trading cards. Some of these comic-related products have won awards including the Dragon & Tiger Heroes’ “Eighteen Dragons Trading Cards, which won the top prize for Plastic Card Printing at the Hong Kong Print Awards in 2000, and the Feel 100% Cup Set, won the award of merit in Packaging Material Printing at the Hong Kong Print Awards, also in 2000. The company has capitalized on the popularity of animated multimedia by adapting a few of our publications into feature films: A Man Called Hero, Feel 100%, and Dragon Tiger Gate. Looking upon the status of global publishers, Culturecom can do much more with its Intellectual Property and proliferate the surrounding opportunities through globalisation. Comics will transition from traditional paperbacks to online e-books, touching upon every mobile device to grasp the maximum exposure of our titles. The company has been targeting the mobile data market as we see the development of digital ecosystems as the future of media. By forming collaborations and partnerships with various mobile data companies, our comic book trademarks will be able to reach across every corner of the media and entertainment world.